Phil Green is the creative production force behind the duo PCSynergy. Along with Dj Catharsis, he expresses all things house & downtempo. His amiable demeanor is personified in his sets. Both Phil and Catharsis have been actively deejaying and expressing positive electronic paradigms since 1991. Phil is a graduate of Full Sail video and audio engineering college in Orlando, Florida. Currently, Phil is the chief engineer at Jax Traxx, a digital recording suite dedicated to electronic music production. Phil Green & his main partner Scott Collins met at Full Sail Engineering School in 1996. In 1999, they decided to break ground on a studio. Scott's wife manages a video editing and production house. Space upstairs became available which fit perfectly. The original studio was built behind a record store and PA equipment rental house. This new location opens up more opportunity. Clients include all genres, transfers, beats, tracking, practice space for bands, you name it. It's a b! eautiful space built with love. 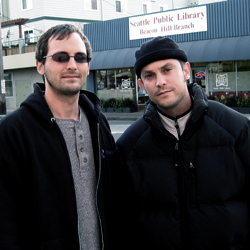 DJ Catharsis, also known as Scott Petersen, has been spinning records for the past eleven years. His musical inspirations are rooted in strong spirituality and the creative influence of his father, a professional jazz musician and educator. "I grew up with jazz, music students and concerts around me all the time," said Catharsis. "A high caliber of talent and passion for music is what led me to the journey I am on now." Catharsis sees electronic music as eclectic and inclusive where artists can take any influence or feeling and create with it. He uses a sequencing program with, he says, the same improvisational spirit his father uses playing guitar. When searching for records, Catharsis concentrates on labels, artists, track structure, and an overall feeling of the tune. A jazz influence and a deeper direction attract him to music, his goal being to share music and educate a crowd. I live one day at a time. I hope to live a happy life with music being an integral part of it." 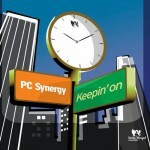 PCSynergy have performed all over the United States along side some of the most innovative electronic artists including Mark Rae, East Coast Boogiemen, Lawn Chair Generals, Rick Preston, Q Burns Abstract Message, Nigel Richards, Hesohi, Corey Black, Noel Sanger, Stryke, Monty Luke, and Sunshine Jones. They have been signed to numerous electronic music labels worldwide, appeared on cd compilations alongside Depeche Mode, Moby, Faithless,Dubtribe Soundsystem, Swayzak, Mr. Scruff and many others. Phil and Scott are also record label owners. The motive for this endeavor is to release an eclectic catalog of House and Down tempo music. Soul Support will express the developing, inquisitive, PCSynergy sound along with an array of new artists and remixes. Soul Support Recordings has released one record to date. Look for more love, change, growth, and music from these artists as the days pass.